RV Pop Up Campers are pretty cool! They start out looking like a little wagon on wheels being towed behind the family car! Next thing you know, they literally "transform" into a pretty large camper on wheels! It certainly won't be "fancy", but, it will sure serve its purpose! The basic units are usually built on just 1 axle with a simple brake system. A great feature of these is the entire "camper" is above ground! Many families that had tenting experiences with bugs and small animals welcomed the little pop up camper! These RV Travel Trailers became instant hits - they were so light that pretty much any car or truck could tow it, it had some very basic utilities and kept you dry and above the ground! Today's little pop up campers will have several large beds, a very small but usable kitchen, water storage - no bathroom though - and usually no generator. As you can imagine, these little campers became very popular with so many outdoors' people. Here's an adorable video about a very cute "little" pop up camper! As you can imagine, a pop up camper was very economical to purchase, was easy to hook up to the family car without getting all kinds of stronger hitches installed, didn't hurt the car towing it - mileage was still OK, easy to handle and kept everyone dry and comfy - a truly great recreational vehicle! 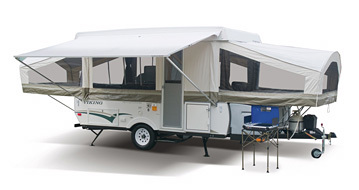 As in any small RV Travel Trailer, they are extremely difficult to back up very precisely! The shorter the distance of the trailer axle to the pivot point (hitch) on the car, the more difficult to back up. No matter how hard you try to be "exact", it will just immediately turn and jackknife the wrong way - guaranteed! As they grew popular, campers wanted more and better amenities! This was a major demise of the popular RV Pop up campers. Here's a really way cool "Everything" Trailer!!! It is a Pop up Camper, a Utility Trailer, it will haul your ATV and just be really useful! We see ATV runners all over the western part of the US. However, this would be a great way to spend a weekend with a full pop up camper that can haul your ATV at the same time!! How slick is that. Plus, it looks a lot safer than some of the "rigs" we see cruisan down the highway. Here's the link to see the company behind it all. It's called a Lifetime Sahara Utility Tent Trailer. Plus a video showing how a different model all comes together!! Yes, indeed!